Don’t rely only on careful packaging alone to secure your fragile items. Make sure everyone handles fragile items with care. 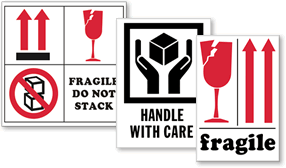 International fragile shipping labels are recognized worldwide, to effectively protect glass and precious packages. • Different sizes are perfect for smaller envelopes, or larger boxes. • Peel-off liner and tough adhesive ensures that your international safe handling labels will stick to almost any shipping container. • Sold in convenient rolls of 500. Check out the designs and materials below to find your best label.